The Woongjin Foundation, a nonprofit organization established by Woongjin Group to help disadvantaged people, held an event in Seoul on Wednesday to mark the 10th anniversary of its music broadcasting program. The program, which targets multicultural families and foreign workers in Korea, airs music broadcasts on 24 channels across six platforms -- internet, satellite, internet protocol television, cable TV, smart TV and smartphones -- 24 hours a day. Ethnic music and cultural programs are delivered by native speakers in eight languages including Chinese, Vietnamese, Tagalog and Thai. 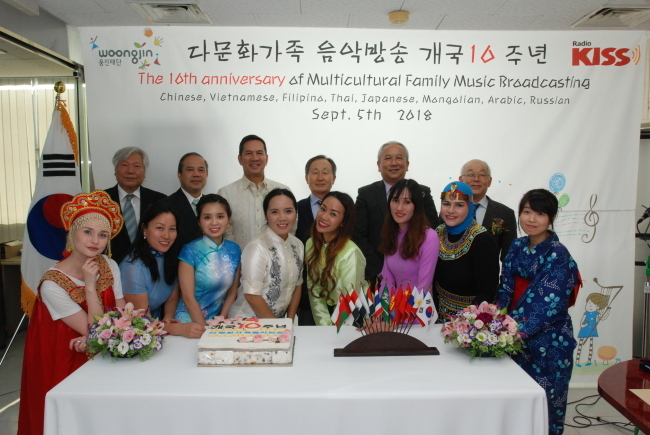 Catering to foreigners and naturalized Koreans who belong to multiethnic families, it also provides news about their home countries, Korean language lessons, and helpful information about living in Korea. Philippine Ambassador Raul S. Hernandez, Vietnamese Ambassador Nguyen Vu Tu and Thai Ambassador Singtong Lapisatepun participated in the event alongside Woongjin Foundation Chairman Shin Hyon-ung, Digital Skynet President Kim Choong-hyun and program anchors from eight countries, as well as local producers and other staff members. The broadcast was launched Aug. 15, 2008, in partnership with Digital Skynet. Over 50 million people have listened to it online, and more than 120,000 people have downloaded the program on their smartphones and smart TVs. The program won the Philippine government’s World Media Awards in 2011, 2015 and 2017.